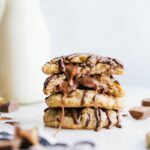 Homemade caramel oatmeal cookies with a gooey chocolate caramel filling and a chocolate drizzle on top. In a large bowl, stir together the flour, oats, brown sugar, baking soda, and salt. Melt the butter and combine along with the vanilla extract and egg. Pour into dry ingredients. Stir everything together until a thick dough forms. You may need to knead the mixture with your hands. Place the dough in the fridge while you unwrap the rolos. Unwrap the rolos. Flatten the dough in your hand and press two rolos into the center of the cookie. Press the edges up around the candies and completely seal into a large cookie. Make sure none of the rolos are exposed or it will leak out during baking. Bake for 9-12 minutes. Slightly underbaking these is the BEST! It lends a softer cookie with melted and gooey caramel. Overbaking these makes the caramel harden when cooled. I pull out the cookies generally at 9 minutes, allow them to sit on the cookie sheet for another 2-3 minutes, and then transfer to a cooling rack to allow them to firm up a bit. To top with chocolate, combine the chocolate chips and vegetable oil in a microwave safe bowl. Microwave for 30 seconds, stir for 15 seconds, and then microwave again in bursts of 15 seconds, stirring in between each burst for 10 seconds until completely melted. Take a spoon and dip it in the melted chocolate. Run the spoon from left to right over the cookies to get the chocolate drizzle.